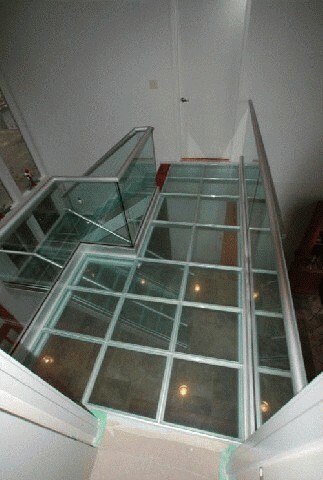 Masonry Glass now offers a floor system engineered specifically for the next generation in structural glass: laminated units 1″ thick. This is good news for any application that calls for drama—or where natural light is at a premium. 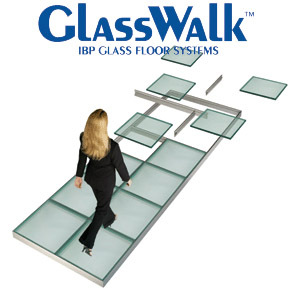 The heart of every GlassWalk structural glass floor system is the modular IBP aluminum frame: strong, lightweight, easy to install, and proven in hundreds of floor applications. 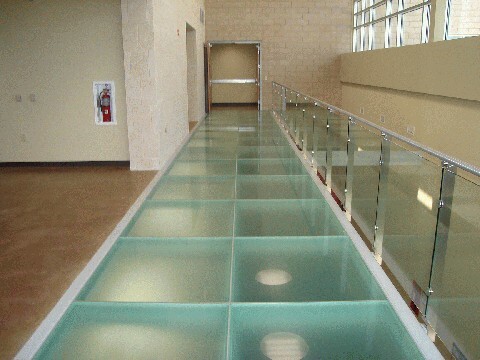 For most installations, IBP supplies two-ply laminated glass units: a top layer tempered for impact resistance and a heat-strengthened bottom layer, bonded with a clear resin interlayer. 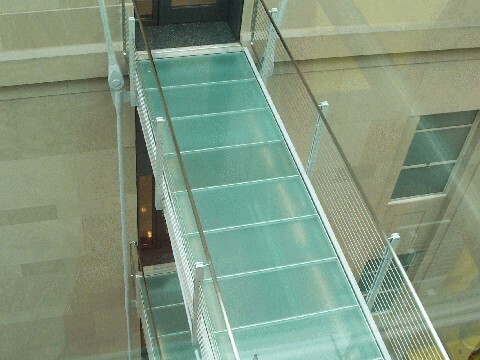 This composition, combined with the performance of the aluminum grid, has been proven in tests by independent labs to meet applicable code requirements for load and impact. 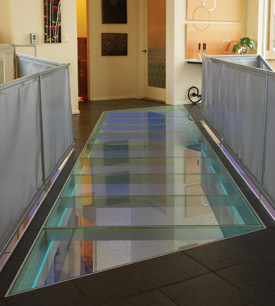 In fact, the GlassWalk SG system is rated for glass units up to a 48″ clear span with a 48″ width — for a full 16 sq. 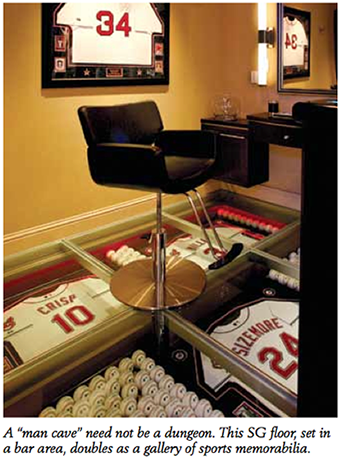 ft. in area—or up to a 89″ clear span in a 5″ width. 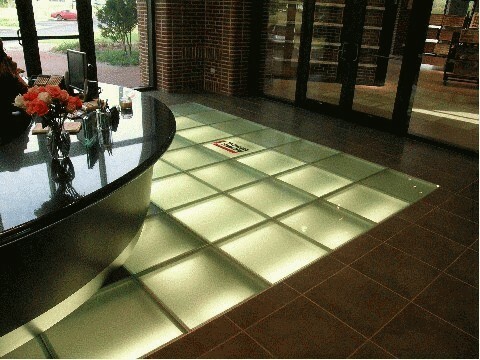 Slip resistance is achieved with a patented ceramic-based frit, permanently heat-fused to the walking surface. Available in a broad variety of patterns, frits provide a wet-dry slip coefficient up to 1.1, which far exceeds the most stringent code requirements—and outperforms acid-etching and sandblasting. 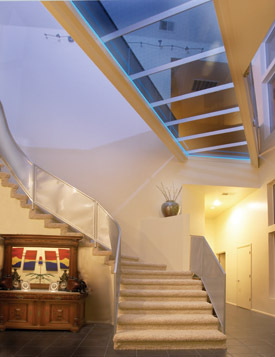 To achieve translucency rather than transparency, a full etched “obscurity frit” can be applied to the interior of the SG unit. 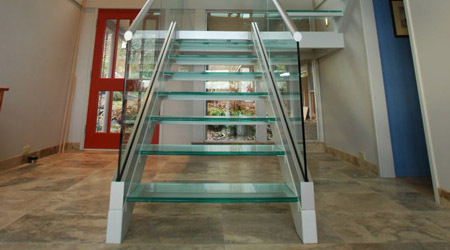 Like all GlassWalk systems, each structural-glass system is shipped as a complete kit, with all Restorations precut to your exact specification — including the glass units themselves. Free detail drawings are available on request.